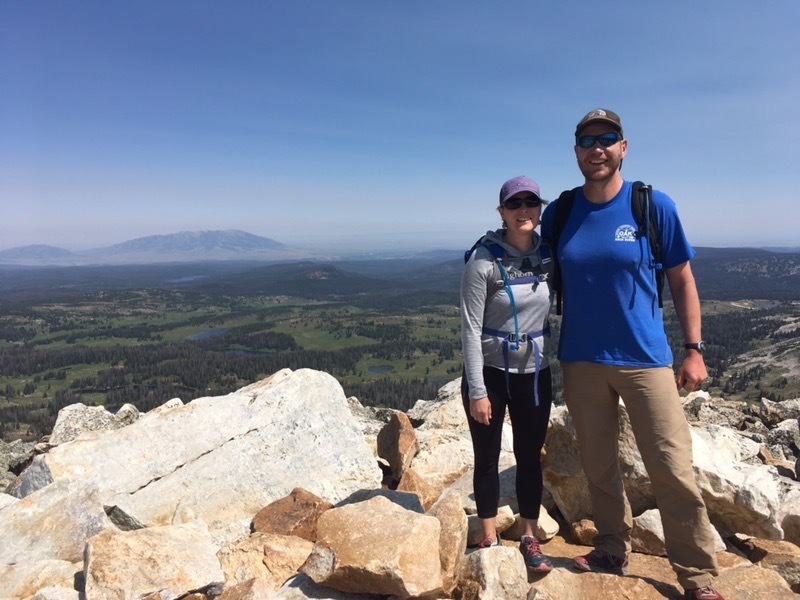 Katie Hogarty and Bryon Lee pause to take a picture on a recent backpacking trip. Time outside is important to Wyoming Outdoor Council members Katie Hogarty and Bryon Lee — whether it’s just sitting (without a cell phone) at Sweetwater Rocks and taking in the smells and sounds, walking their dog in the open space next to their Laramie home, or celebrating a wedding anniversary with a backpacking trip in Wyoming’s high country. “Wyoming has connected me so deeply in my soul to a place,” Katie said recently, noting that while that may sound hokey, it’s true. Bryon agrees. “The importance of the work you all do — it inspires people to act, and act with future generations in mind,” he said. Katie, a former policy analyst for Gov. Dave Freudenthal, is the Laramie program director for Wyoming Climb and a member of the Wyoming State Bar. She also serves on the Board of Equal Justice Wyoming and volunteers with Wyoming Public Radio. Bryon is a Laramie school counselor who’s active in Big Brothers, Big Sisters. They lead busy professional lives, to be sure. But they also carve out plenty of time for outdoor activities. In fact, they spent much of this past July outside — starting with a Fourth of July hike up Medicine Bow Peak. Later that month, Bryon joined 350 other cyclists for the Tour de Wyoming ride along portions of the Red Desert to Hoback mule deer migration corridor (and donned WOC-sponsored felt antlers in honor of the “herd”) before meeting up with Katie in Jackson to go backpacking. Katie and Bryon see the state’s outdoors and vast, intact wildlife habitats as central to Wyoming’s identity. They frequently respond to WOC calls to action because they recognize that sound information paired with a personal message to a decision maker or agency staffer can make all the difference when it comes to protecting the places they love to fish, bike, and hike. But their support of conservation and the Outdoor Council’s efforts doesn’t end there. Bryon has made it a habit to give gift memberships to nieces and nephews for birthdays and other occasions — a great opportunity to discuss the importance of Wyoming’s environmental health and outdoor heritage with a younger generation.